United States President, Donald Trump on Wednesday said that the election results handing a narrow victory to right-wing Israeli Prime Minister, Benjamin Netanyahu has given a better chance to a yet-to-be unveiled US peace plan. In his congratulatory message to Netanyahu, Trump predicted that the victory would boost his administration’s promised plan for a settlement to the lingering Israeli-Palestinian conflict. “I’d like to congratulate Bibi Netanyahu. The fact that Bibi won, I think we’ll see some pretty good action in terms of peace. “Everybody said you can’t have peace in the Middle East with Israel and Palestinians. I think we have a chance and I think we now have a better chance,” Trump said. The almost-complete results of the tight poll has put Netanyahu in pole position to form a narrow parliamentary majority with a coalition of right-wing and religious parties, allowing him to become Israel’s longest-serving prime minister. 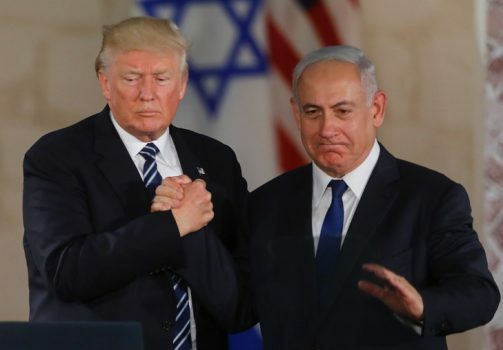 Trump had severally backed Netanyahu, making controversial gestures of support to the Israeli leader, including recognizing Israel’s sovereignty over the occupied Golan Heights area.